It Starts With Food is a diet program created by husband and wife team Melissa and Dallas Hartwig. The couple, both certified sports nutritionists, have pioneered a program they call The Whole30™, designed to change your life in 30 days. In this book they present a 30-day nutritional reset to help you change the way you eat and transform your life. This eating plan will heal your digestion, reduce inflammation, stop cravings, repair your metabolism and create new healthy lifestyle habits. This diet is very similar to The Paleo Diet. The authors have offered their Whole30 program to thousands of people via their online health and fitness community since 2009. Many people have experienced weight loss, better life quality, a healthier relationship with food and significant health improvements. This diet is very strict and requires a 30 day commitment demanding radical changes to your diet with no substitutions allowed. Stringent guidelines make it easier for you to follow the program because you don’t have to think about what to eat. After the 30-days you will know more about how certain foods affect your body. Then you will have the ability to choose what to include in your diet in order to maintain optimal health. Consuming adequate protein is the key to the entire plan so protein is included in every meal, starting with breakfast. Protein keeps you feeling full and stabilizes your blood sugar levels, which reduces cravings and overeating. One to two palm-size servings of protein – high-quality meat, seafood or eggs. One or more fat sources – avocado, coconut, nuts. Fill the rest of your plate with vegetables. 1-2 cups of coffee a day. You should avoid snacks if you can help it and have your last meal a few hours before going to sleep. This helps promote the optimal hormonal balance for appetite control and weight loss. At the end of Whole30 you will gradually reintroduce these foods – one at a time – observing how your body responds. If you have a negative reaction to a food then it is best to avoid it. Also if you don’t miss some of the foods you eliminated then don’t bother reintroducing them. You don’t have to stop the diet at the end of 30 days. In fact, you can stick with the program for as long as it takes to get the results you desire. Beef, buffalo, lamb, ostrich, goat, squid, scallops, shrimp, eggs, asparagus, kale, lettuce, broccoli, green beans, sugar snap peas, avocado, blueberries, raspberries, cherries, melons, coconut butter, olives, macadamia nuts, olive oil, clarified butter, balsamic vinegar. Whole30 doesn’t come with a specific exercise plan. Information is provided on what to eat before and after working out for physically active individuals. 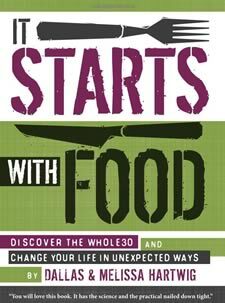 It Starts with Food: Discover the Whole30 and Change Your Life in Unexpected Ways retails at $26.95. May improve a wide variety of chronic health conditions. Each meal contains protein, which helps to keep appetite under control. Based on scientific research as well as real-life experience. Includes recipe templates to make meal preparation fast and easy. Very restrictive and requires dieters to eliminate a wide variety of foods. Many dieters experience intense food cravings during the first week. Will require time for menu planning and food preparation. It Starts with Food offers a diet plan to resolve stubborn health issues and assist you to find a permanent weight loss solution. Whole30 can work effectively as a jump-start to help create a healthy way of eating for the rest of your life.